Tarek Chemaly: Gillette: A proof that advertising is not everything! Gillette: A proof that advertising is not everything! So here's a proof that advertising is not everything! You know we ad people have a big ego - we think we can control everything: Consumer perception, sales, brand performance, people's reactions, and that basicaly the wole universe revolves around us (an idiotic ad man went on television and said "I am the new face of advertising in the Middle East" - I kid you not!). 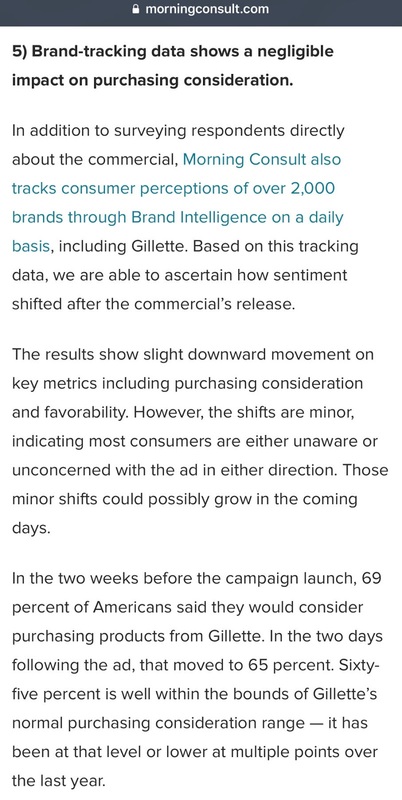 So there, with the new Gillette ad - which produced a lot of backlash mind you from people who thought it was patronizing in tone - and which I happened to like (see here) - but numbers tell a different story if you bother to read the paragraph in the photo above. 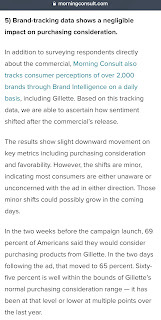 There was simply a slight dip in consumers' perception of the public's willingness to buy a Gillette - from 69 to 65 which was within margins. So there, Pepsi did not stop selling soft drinks after the the Kendall Jenner debacle (read here), and the list continues. So you see, there are many - many - more elements to this than us ad people "making or breaking" a brand. On my cubicle on an ad agency I worked in I put a sign that said "please check your ego at the door". So yes - let's get down our high horse: Advertising is not everything!